Preheat oven to 400 degrees F. Butter an 8x8 casserole dish and set aside. Bring a large pot of water to a rolling boil; add the broccoli and cauliflower and blanch for 1 minute, then drain well. Melt butter in a deep skillet over medium heat. Saute onion 3-4 minutes, then add the garlic. Stir in the cream cheese until melted, and then stir in the heavy cream, mustard, salt, pepper, half of the cheddar, and the mozzarella. 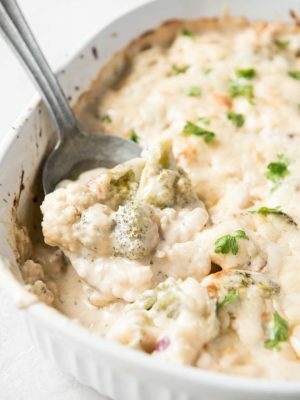 Once the cheese is melted, stir in the broccoli & cauliflower. Pour the contents into the prepared dish and top with the remaining cheddar. Bake uncovered 20-25 minutes, until cheese is bubbling and golden.